As a kid, my parents had a subscription to National Geographic. Somewhere along the way, I (well, really "we" as a family, but I sort of commandeered it) came into possession of the National Geographic Picture Atlas of Our Universe (Roy A. Gallant, published by TBS The Book Service Ltd, 1980). I'm not sure if it was giveaway as part of a subscription, or if it was a book for purchase that my parents thought I (and my siblings) would appreciate. 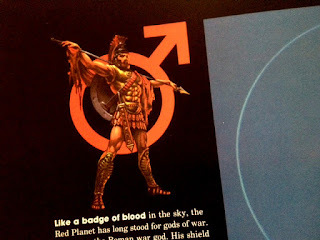 Regardless, it became THE book that informed my knowledge of the solar system, and what the solar system might be like in an alternative sci-fi-informed reality. 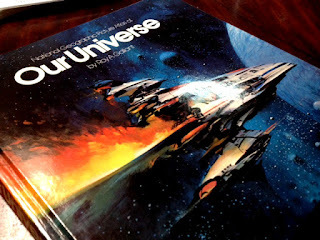 To this day, it one of the 2 books that forms the foundation for how I "see" sci-fi gaming (the other is Profiles of the Future by Arthur C. Clarke). I won't go into too much detail on how this book inspired me, because Brian Koberlein has done a nice, concise job of expressing the same sentiment. Long ago, the book left my parents house. I believe it went to Goodwill or similar. Well recently, I came across a copy at an estate sale, and could not pass it by... especially for just a few bucks. So I thought I'd share a few things from the book that I find particularly striking. Let me start with the image that first struck me... the cover. It's a killer painting of star cruiser by John Berkey. If that names sounds familiar, it's likely because he's did a number of paintings/illustrations for Star Wars Episode IV. 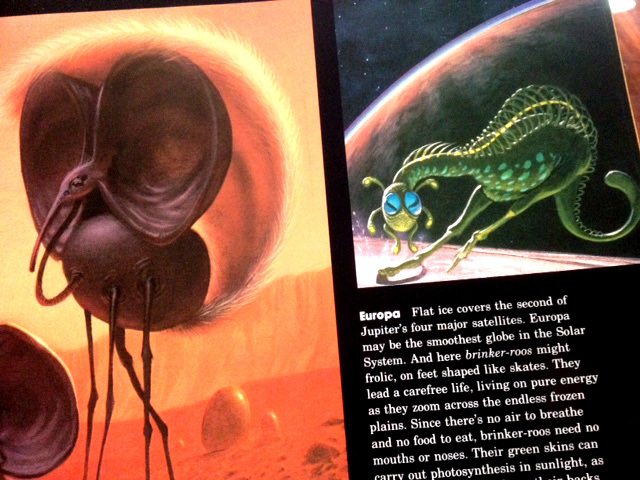 In the bigger scheme, his contributions were fewer than Ralph McQuarrie, but important nonetheless. BTW, though Berkey died in 2008, many of the paintings he left behind are available for licensing (and I'd love to see somebody in the community license his art for a cover). 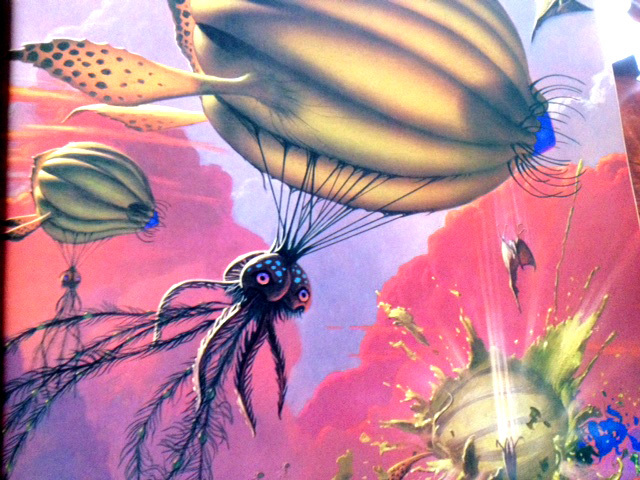 In fact, should I ever get back to Starmasters, Berkey's, I hope to do just that myself. Now let's look at a couple of key images from the interior. One of the first things that struck me were the "What if..." images, speculating what alien life would be like on our solar system's planets and their moons. Check these out! And then, the pages for each planet almost read like an appendix to Deities & Demigods. I'll leave it at this for now. I just wanted to share a little slice of my childhood that was recently re-found, and share that with you. 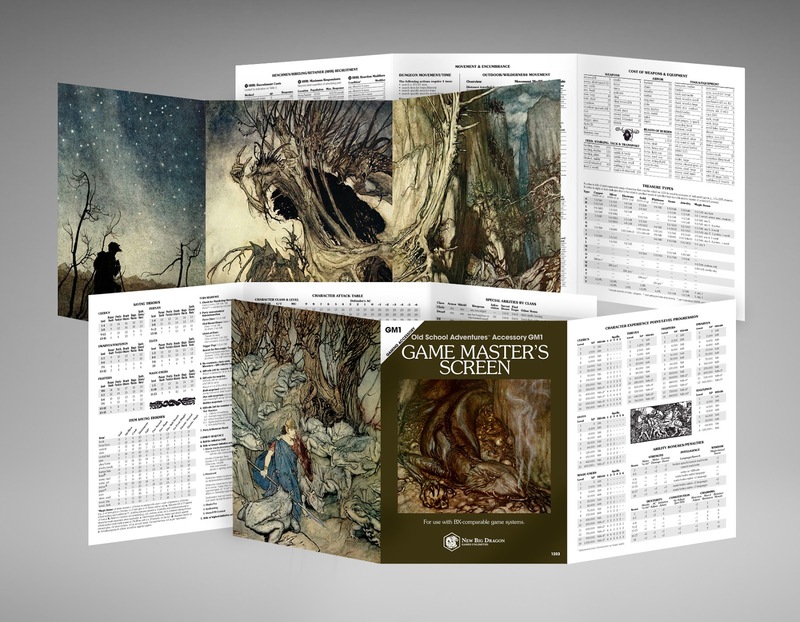 Now that the kickstarter has gone live for the Classic Editions GM Screen Package, I will tell you... pricing a Kickstarter is no easy feat. I know we laugh at those hopeless romantics (or is it lunatics) that ask for a single backer at $7500, with no real explanation of what they're getting, but there's something to be said for the simplicity of that pricing model. Over the course of 2 months, Welbo and I looked at spreadsheets, and more spreadsheets, and yet more spreadsheets, as we balanced: the cost of the various materials, the number of items we would have to produce to get price breaks, and the fees... OH, THE FEES! Right off the top, Kickstarter and the bank take about 10% of your money. A lot of people don't realize that they can't just add 10% to their costs to figure out these fees. For example, if you know you need $1,000 to pay for the items you plan to produce, if you simply add $100 to cover the 10% in fees, then take 10% away from $1,100 to pay the fees, you're left with $990. To net 90%, you have to add like 12% to the total cost. Even at $35 that adds almost $4 to your cost (so if you're producing a $35 item, you have to set the backer level at $39). DANG! The next thing Welbo and I heard time and time again from other Kickstarter creators (and very successful ones at that), and something we absolutely had to consider, was how the cost of shipping really bit them in the end. Shipping really has 2 costs: 1) the actual postage, and 2) the materials you need to package the products for shipping so that when they arrive they're not all beat to hell. A single set of materials for our KS comes in at just over 1 pound (not including the packing materials). We decided the economically surest thing for all involved was to include domestic shipping (with additional charges for Canadian and International backers). The next thing to consider with this KS is the actual production costs. After all, this is really 2 different screens (for 6 total panels compared to the standard 2 or 3), plus 13 additional items. Additionally, we wanted these to be truly sturdy (from our POV, we felt like anything under 15 pt. was just too flimsy) so we've gone with a 30 pt. thickness (made by gluing two 15 pt. cover pieces together). Then there's the overall UV coating to protect it. For comparison, take a look at the Labyrinth Lord DM screen from a few years ago. That was a single 3-panel piece on 14 pt. cover with UV coating (which is only half as many "screens" on paper that's less than half the weight/thickness of our screens). Our goal was not to produce the cheapest GM screen. If it was, we'd have done a single 3-panel piece on 14 or 15 pt. cover with only the minimal charts needed for the table, and left it at that. What we wanted to produce was a very substantial-feeling piece that looks like classic gaming, whose content is so extensive you could almost leave your rulebooks at home, and something that looks cool as hell on the table. At the end of the day, given the production standards and the things we can't control (KS fees, postage, etc. ), we believe that we're providing an impressive set of materials well beyond the backer costs. Obviously, we know this kickstarter isn't for everyone, but for those who are interested, we're sure you'll be happy with the end result. This is one of a number of creatures that I drew last week and previewed over at Google+. For those familiar with Vault of the Faceless Giants, you know the campaign I'm developing has some definite Eastern influences (though it will become a little more "generic" as it progresses). 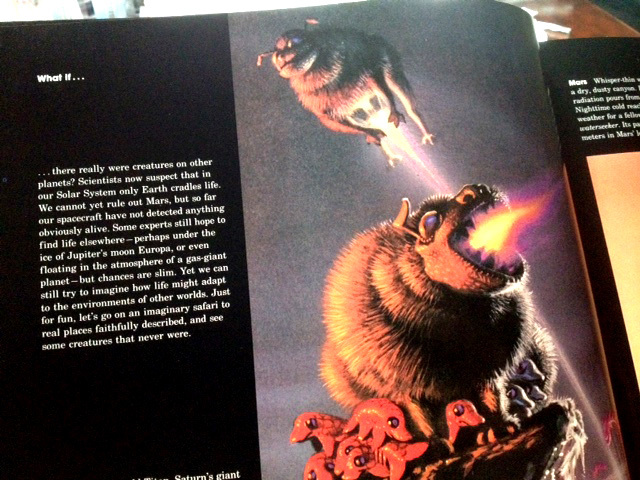 You also know from the Creature Compendium that I'll mine any culture if it produces an interesting monster. That leads us to today's monster via Japanese mythology... the nue. This thing is pretty nasty, and should give even an experienced party of good size a run for their money. This ferocious and deadly creature is a native of the Plane of Dreams, though it is often found in warm forests and jungled mountains on the Prime Material. A nue is able to shift between two forms at will. The first form is a 10’ cloud of inky black darkness. It will often assume this form to hide in shadows, waiting to ambush its prey, emerging to attack in its standard form—a chimeric creature, 7’ long and weighing 500 pounds, with the head of a monkey, body of a raccoon dog, legs of a tiger, and tail as a poisonous snake. In either form, a +1 or better weapon is require “to hit.” A nue is only able to fly in its cloud form. The nue is vicious and malicious creature, always seeking to sate its unquenchable hunger. In its chimeric form, the nue strikes forward with 2 claw attacks, and a bite that does 1d4 and, on a failed saving throw vs. spells, drains 1d4 levels. Levels lost to a nue are regained at a rate of 1 level per full night (8 hours) of rest. The bite of a nue’s tail-snake strikes to the rear, doing 1d2 damage and, on a failed save vs. poison, causes death. 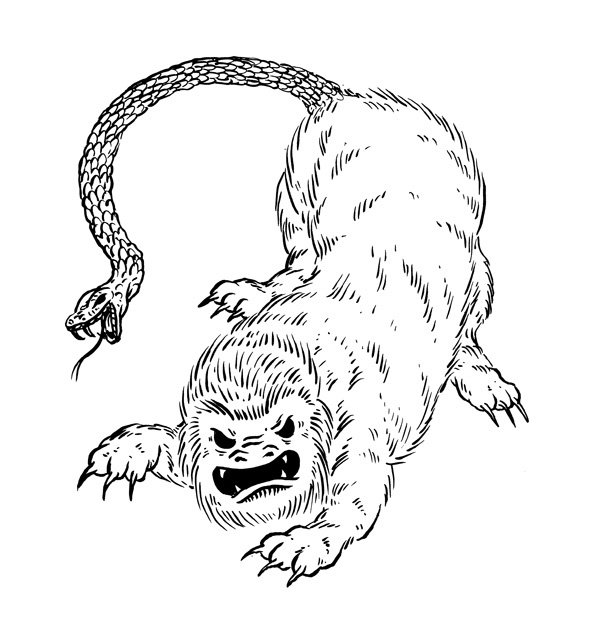 Furthermore, any creature meeting the gaze of the nue’s monkey-like face must save vs. paralysis or contract a disease that, until cured, negates the natural recovery of levels lost to the bite of the nue. During any round, the nue may forego its monkey bite attack to use one of its three magical attacks (but may still use its claws and snake bite during the same round). Once per day, a nue is able to cause nightmares in a sleeping creature with sentience. The restless sleep caused by these nightmares causes the victim to flail, taking 1d4 damage per hour for a duration of 1d4 hours. A saving throw vs. spells will have the damage. Waking the victim will only postpone the completion of the nightmares’ duration, but will not stop them from happening once the victim returns to sleep. The dreams with which the nue will impregnate a mind vary from victim to victim, but will almost always feature a dark and foreboding cloud of malice. Once per day, a nue is able to send out a shockwave of fatigue. 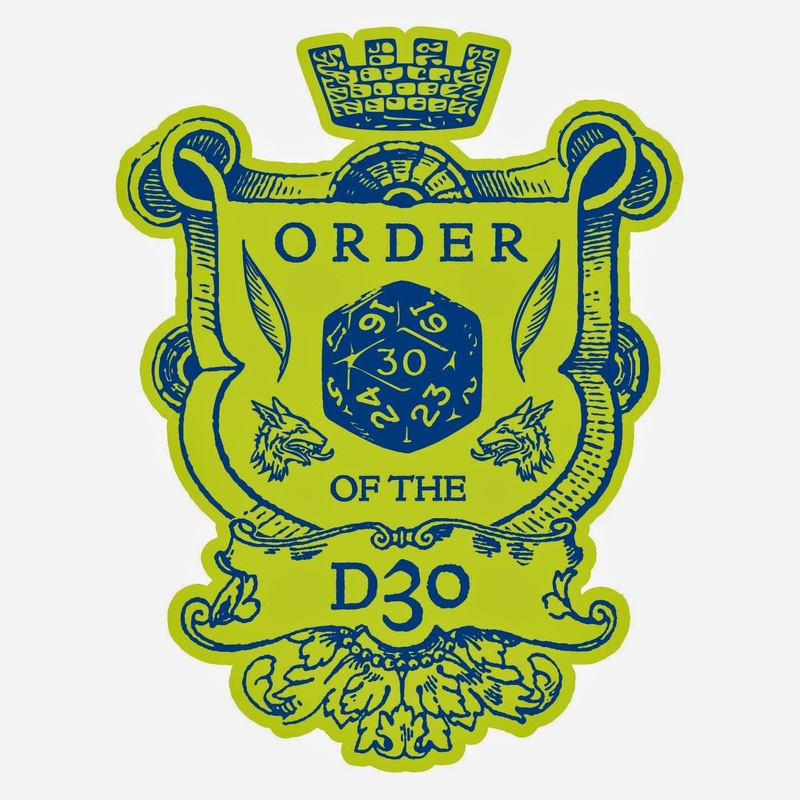 All those in a 30’ radius during the round when this wave is emitted must save vs. breath or be slowed to half movement and suffer a –1 penalty on all attack rolls and saving throws for a duration of 1d6 turns. Three times per day, a nue is able to cast hold person as a magic-user. In its cloud form, a nue becomes insubstantial, making it immune to poison and sneak attacks (in addition to normal weapons). In this form, the nue cannot make its normal physical attacks, and also loses its gaze attack. In its cloud form, the nue can still create nightmares, cause waves of fatigue attack, and use its hold person spells. Vision for those caught in the cloud is limited to 5' (even with the use of infravision). 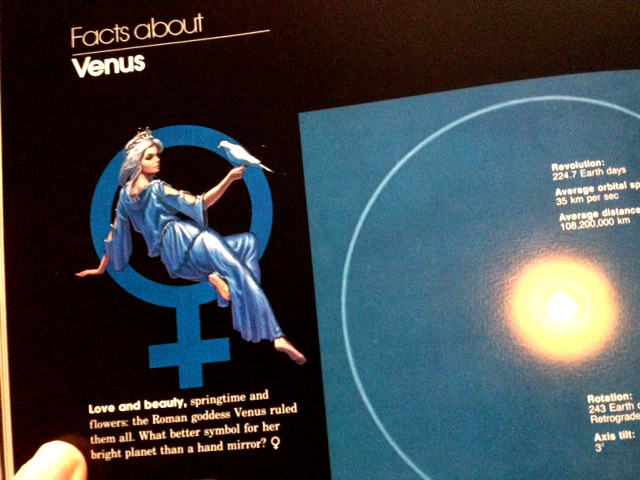 Nues have their own language, but are also able to speak common and celestial. This is another post in a series of additions for the Basic Psionics Handbook. Thus far, this has included: the celebrilith, some new powers (ectoplasmic form, detection of psionics, brain lock, mind trap), and yesterday's phthisic. The phthisic included a couple of powers that needed BXΨ write-ups, so here they are: catapsi (a synaptic static like power) and skate. By manifesting this power, the psionicist generates psychic static, interfering with the ability of other psionic characters to manifest powers (the user is not affected by their own catapsi manifestation). Each time another psionic user attempts to manifest a psionic power within the radius of this power, they must make a successful psionic saving throw or the PSP cost of the power is doubled. This power does not effect psionic powers manifested outside the range of the catapsi or before the catapsi went into effect. Because the PSP cost of the ability is effectively doubled, it affects the total number of powers the psionic character may have active at the same time; thus, a subject may not be able to manifest their highest-level powers. If manifesting a power would cause a manifester in the area of effect to exceed their available PSPs or spending limits, the manifestation fails automatically, but no PSPs are expended. This power allows the psionicist, another willing creature, or an unattended object (total weight up to 100 lb./level) to slide along solid ground as if on smooth ice. If the psionicist manifests skate on themself or another creature, the subject of the power retains equilibrium by mental desire alone, allowing them to gracefully skate along the ground, turn, or stop suddenly as desired. The skater’s land speed increases by 30'(10'). The subject can skate up or down any incline or decline that they could normally walk upon without mishap, though skating up an incline reduces the subject’s speed to normal, and skating down a decline increases their speed by an additional 30'(10'). If the psionicist manifests skate on an object, treat the object as having only one-tenth of its normal weight for the purpose of dragging it along the ground. Like the cerebrilith from a couple of weeks ago, this is not so much a "new" creature, as it is a B/X adaptation of an existing creature (using the Basic Psionics Handbook). 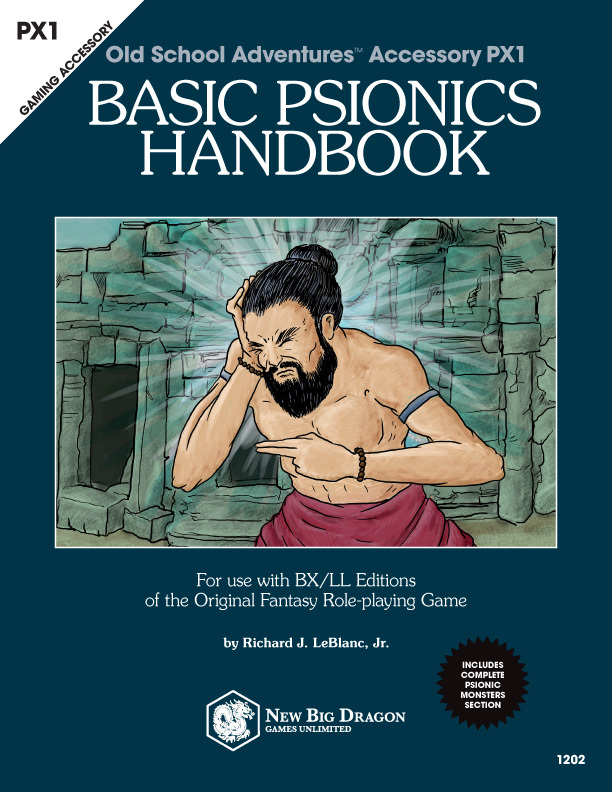 As with the cerebrilith, you'll notice there are a couple of psionic abilities listed that don't appear in the Basic Psionics Handbook, and weren't part of the new powers post from the same week as the cerebrilith. Have no fear. Those abilities will be showing up on this blog in the next couple of days, including: catapsi and skate. A phthisic is a living, breathing neurosis, wrung from the deepest part of a repressed mind and made flesh. These creatures are created with the use of a twisted form of psychic surgery known only by the most depraved and evil of psionicists. The sole goal of a phthisic is to feed on the mental energy of other beings, which can leave their mind permanently damaged. A phthisic stands 10' tall and weighs 600 pounds. It vaguely resembles the person from whose mind the phthisic escaped, but is severely distorted (there is a base 25% chance, plus 5% per point of Intelligence, that someone who knows the individual from whom the phthisic was sprung will note the resemblance). A phthisic that hits with its bite attack also deals 1d4 points of Intelligence damage (no saving throw). Victims of Intelligence loss will regain lost Intelligence at a rate of 1 point per 12 turns (2 hours). If this effect reduces the opponent’s Intelligence score to 0, the drain becomes permanent—the victim cannot think and is unconscious in a coma-like stupor. Permanently lost Intelligence points can be recovered through the use of psychic surgery. A phthisic regenerates at a rate of 1 hit point per round, and cannot be permanently destroyed except by fire or acid. 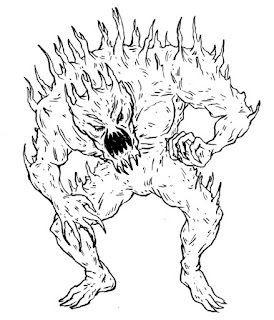 If a phthisic is damaged enough to kill it (reduced to 0 hit points), it will continue to regenerate and stand again to fight after 2d4 rounds. A phthisic speaks the primary language of the mind that birthed it, usually common.